MUSIKMESSE 2011 Press Release: Ampeg today announces a series of new bass cabs and heads that deliver the innovative form-factor of Ampeg's legendary flip-tops in designs that are powerful, compact and extremely portable - Ampeg Portaflex Series. "The flip-top design and Portaflex name are nothing short of iconic," remarks Ampeg product manager, Zane Williams. "The new Portaflex Series is for every bassist who obsesses over the classic B-15, but demands the features, portability and power that modern heads offer." The ultra-compact PF-350 and PF-500 heads are Class-D designs with modern features like onboard compression/limiting, balanced direct outs and switching power supplies. Both heads match perfectly with the vintage-styled PF-115HE and PF-210HE cabinets. The flip-top design allows bassists to store the head, cables, etc. right inside the enclosure for ultimate portability. Covered in sleek diamond black tolex and featuring premium Eminence speakers, the genuine Ampeg look and tone are unmistakable. 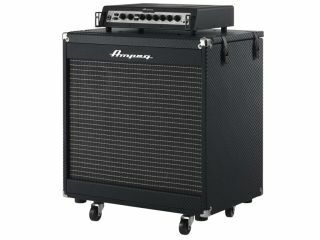 The Ampeg Portaflex Series will be available domestically in March, 2011 and internationally in April, 2011. The heads and cabinets are sold separately: PF-350 (€349 inc tax & £289 inc VAT), PF-500 (€449 inc tax & £375 inc VAT), PF-115HE (€449 inc tax & £375 inc VAT) and PF-210HE (€449 inc tax & £375 inc VAT).